Welcome to the News Building – our new home, as News UK. As you can see on the screen, we’ve spent most of the summer moving in here, so the title of this conference feels particularly apt for us. News – in our case – has quite literally been “on the move”. It also feels like we’ve moved on quite a bit in the two years that have now nearly passed since I took THAT call. Back then it was Rupert – of course – asking me, out of the blue, if I’d leave Sky to take charge of “News International” (as was), moving from West London to Wapping. I reminded Rupert that I had never worked in newspapers. He said it didn’t matter, and he wanted me for what I knew about the subscription business. It was an interesting time to take over. This company had some serious challenges of its own making that it was still working through. And the industry itself – many thought – was in terminal decline, with some genuinely questioning whether newspapers would survive at all. Even worse – it wasn’t obvious to everyone why they should care. But we’ve come a long way since those initial impressions. And for us in this building at least, a key part of that journey has been to think hard and often about our fundamental purpose. And today I’d like to dwell on that core purpose. Now, I’m a relative newcomer to this industry, but I was struck from the moment I arrived by the strong sense of purpose it enjoys. I had some experience of sense-of-purpose from my time at Sky, but this place is in another league entirely. …why world class, independent, professional journalism matters …… and then to make that the core of our business strategy. Of course, I’m not saying every single article in every publication reflects some sort of noble purpose. Newspapers are not always nice, not always pretty. But we are a bundle of content and at the core of that bundle is news, making people think, question and imagine. A celebrity front page can sometimes look a little thin on noble intention, but if it draws in a reader who then stumbles on the shrewd political analysis of Trevor Kavanagh, or the playful commentary of Tony Parsons, it is serving that core purpose indirectly. The Sun in Scotland these days is edited by a former showbiz reporter, but that didn’t stop Gordon Smart publishing more than 1,100 pieces on independence over the last few months. Indeed, I’ve been profoundly struck over recent months by the enduring relevance and impact of our journalism. Let me give you three recent examples. The first is the Sunday Times exposé of corruption surrounding the 2022 Qatar World Cup bid. There had been questions about this bid floating around for some time, but it took the power of a brand like The Sunday Times to give the story true depth and reach. The depth came from some remarkable work of the Insight Team, Jonathan Calvert and Heidi Blake, who revealed a cache of documents showing the secret payments that helped Qatar to win the bid. The reach came from the Sunday Times turning what had started out as intriguing rumours into a global story that shook the foundations of FIFA. According to Kantar Media, the work of these two skilled individuals reached an amazing total potential audience of 1.3 billion people around the world. That’s an enormous relevance and impact. Not bad for a conversation that began behind a so-called pay wall. The second is The Times’ focus on the sexual exploitation of young people in care in Rotherham. Following a series of prosecutions of men in Rotherham, Rochdale, Derby and Oxford, Times reporter Andrew Norfolk began investigating the role of the police and child protection agencies in failing to stop these offences. Details from 200 restricted-access documents were published in The Times, showing that those in positions of responsibility had had extensive knowledge of these activities for a decade. These articles prompted the independent investigation in Rotherham, which reported in August and revealed the incredible story of 1,400 victims. Andrew rightly has received industry awards for his work, which took courage and sensitivity in modern multicultural Britain. It’s difficult to imagine a story with greater impact or relevance to our politics and society. Third, I want to mention The Sun’s coverage of the evolving crisis in Iraq. This has been a huge story for most papers but, as is often the case, it takes a Sun front page for the content of a story really to break through. I love “Big Baghdadi”, not just because of the pun, but because the headline brought the story to life and got it being discussed on the airwaves and across the country. Accessibility is the key here. The Sun has an enduring power to get an important story beyond the metropolitan elite and get it discussed in the pubs and the workplaces of Britain. Now I’m not arguing that newspapers are the only place where news happens. Social media also provide a constant news drumbeat which can reach millions instantly. It certainly provides reach but can you always trust it? And among the cacophony of opinions, who do you listen to, who do you take seriously? And do the bloggers have the resources needed for sustained, effective journalism? … even Panorama is being scaled back we now hear. And with a legal requirement to be unbiased, comment and opinion is not a feature of the UK TV news offering. Further, publicly funded news, whilst a great British tradition, relies on Parliament for its funding, is never very far from a Charter or funding review, and so inevitably has to operate with a degree of compromise and coyness. This means the role of newspapers remains highly distinctive. We sustain detailed investigations that confront the controversies that others avoid, offering the public independent, rigorous and trusted news. We offer comment and opinion worth listening to, with real authority and insight. We provide reach, but also depth of analysis, which isn’t easy to capture in a TV sound-bite or 140 characters. Broadcasters report the comings and goings, claims and counter-claims, the set piece proceedings – but where’s the real story? That’s often down to us. So it’s no surprise that TV broadcasters begin most mornings looking at the newspapers to establish the day’s news agenda. Nowhere is this more true than in the coverage of politics. We are less than seven months away from the UK general election, an event that could have a profound impact on the future of the country, not to mention the careers of several of our politicians. Many of the journalists here today are no doubt relishing the prospect! Now, there’s something about politics that attracts the counter-factual question, and the impending campaign got me thinking: what would politics be like if professional journalists ceased to exist? What if the newspaper industry failed to navigate the digital revolution, our papers all closed, or at least were reduced to a small pool of journalists aggregating and re-publishing news generated by others. How would elections be different? What about our democracy itself? Newspapers have played an important role in our political system, certainly since 1785 and the launch of the Daily Universal Register (as The Times was originally called). The first edition said it was created “to record the principal occurrences of the times; and to abridge the account of debates during the sitting of Parliament”. We still play that role today, albeit with I hope a clearer page layout! But what if papers ceased to exist? What would we miss? In asking this question, I’m thinking beyond the partisan loyalties of different titles. 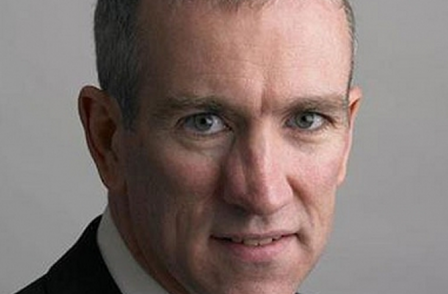 If you are a Conservative, you might be delighted if The Guardian ceased to exist. And even if you are the Labour leadership, there might be occasions when you wouldn’t mind that prospect either. Of course, different papers have supported different parties over the years. The Times, for example, has over the last seventy years backed Labour, Liberals, Conservatives and none. At any one moment, depending on your political leaning, you may prefer that The Times existed or not. But my question is a deeper one. What would be lost to politics if, regardless of their individual political leaning, all newspapers – and their pool of professional journalists – ceased to exist? There would still be news of a sort. We would still have TV broadcasters and their websites, as well as aggregators and social media, but how would it feel without newspapers? Let me offer FOUR things that I’d miss about politics without the professional journalism provided by a thriving newspaper industry. First, I’d miss the facts. We rely on newspapers to act as the record of the political events of the day, the source for accurate information about what’s going on in Westminster and beyond. Their pages create space for the detail, often glossed over by TV or radio, and ignored by an under-resourced website. And the details are made easy to understand and explore, with designers organising information into tables and graphics to ease the experience. Then there’s opinion polling, which newspapers pay for in substantial quantity, and is a central feature in our recently launched Red Box email. The first poll commissioned by a UK title, I am told, was in the News Chronicle in 1938 for the Fulham West by-election. Since then, polls have become an essential component of political coverage. 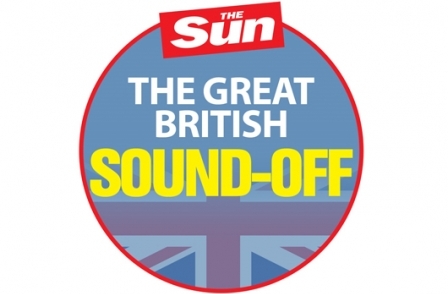 Today we poll the UK public almost every day for The Sun, Times and Sunday Times. That’s a huge databank available publicly for analysis and dissection by the political geeks. And our Red Box email offers a daily update with high quality political analysis and comment, and exclusive YouGov polls, free for those looking for even more insight. Then there’s the debate. Politics is rooted in the battle of ideas, and newspapers remain the natural home of political debate. Even within the pages of the Times or The Sun we offer a range of views, and across the industry we cover all angles. We also provide a platform for the opinions of politicians themselves – even if occasionally they may regret giving them. 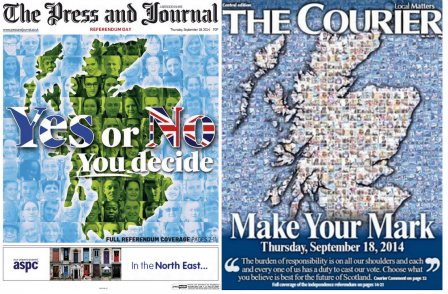 A great example of how newspapers can really foster a debate is the recent independence referendum in Scotland. It was the Sunday Times poll, for better or worse, showing the YES camp ahead, that threw the NO campaign into turmoil and sparked an entirely new debate about the sort of powers that would be devolved if Scotland voted to retain the Union. But we’ve also commissioned some research specifically looking at the role of newspapers in the referendum debate and I want to share the results with you today. The research showed that 60% of Scottish voters got a significant or very large amount of information about the issues, campaigns and debates about independence from newspapers and their websites. This compares to 54% who said they got a lot of information from social media and 44% who said they got a lot from the Yes or No camps directly. Just think about that for a minute: in the recent Scottish referendum, held at a time when the digital revolution is in full flow, newspapers played a more significant role than either social media or the campaigns themselves. Newspapers remain central to healthy political debate and the Scottish referendum just proved it. Third, where there is politics, there is sometimes scandal and controversy, and newspapers play an invaluable role in shining a light on this, highlighting hypocrisy and exposing corruption. The best example of this in recent times is, of course, the Westminster expenses scandal. The story was broken not by one of my papers but by The Daily Telegraph. They provided in-depth analysis of individual MPs’ expenses, something that required weeks of preparation and significant expense. There was also considerable political risk in breaking this story. It’s difficult to imagine a broadcaster like the BBC or ITV, for example, being prepared to run such a story first, especially when they are required by licence condition to be impartial. Although uncomfortable for many politicians, few would now deny politics is better for these issues being brought to light, and that only happened because a newspaper was willing to publish them. Politics would be very dull without newspapers to keep us smiling – whether it is the wonderful humour of the parliamentary sketch writers or the brilliance of the political cartoon. Cartoons have a unique ability to sum up the issue. As does The Sun’s front page. … and the conference rooms on the Sun floor below have been named after some of those famous headlines. So – if it’s not too pompous – when debating our business strategies, I believe we should start with a sense of purpose. And when pondering our purpose, we should remind ourselves that strong democracies need strong media, able to keep the public informed about the actions of their government and the decisions they take in our name. Professional journalism is not about being cheerleaders for politics. But in providing a sustained focus on public life, we provide valuable space to politicians whose legitimacy depends on their ability to engage a sceptical and often disinterested electorate. Politics is too important to be left to the spin-doctory of party press officers alone, or the rumour mills of social media. It needs detailed analysis and courageous debate, something that newspapers do particularly well. This is not to claim newspapers have a monopoly on political truth. Politics is stronger when there is a spectrum of opinions. Listen to a radio phone-in any day of the week and you will quickly be reminded the world is not short of opinions. This is especially true of Twitter. In one day on Twitter, you can read millions of different opinions – some controversial, some insightful, and those are just the tweets from Rupert. But for those who follow politics, we crave sound above the noise, the melody rather than random notes. Newspapers remain the home of journalism that makes you think. We have the credibility, the skill and the nerve to set the agenda and pose the important questions. … and happily, this also represents the foundation of our economic success, because something distinctive and valuable might just be worth paying for. And if we keep that in mind, I believe newspapers will continue to have a major relevance and impact for many years to come. So thank you for listening to these thoughts today. Granted, I have only worked in this industry for a couple of years – but these are views I’ve held personally for some time. I arrived in the UK in 1989 and was immediately struck by the presence of 12 national daily newspapers and the extraordinary variety of views expressed so vigorously therein. I come from Wellington in New Zealand – so grew up with two city-based newspapers, one in the morning, one in the evening … and even they have since merged into one. Perhaps because of the paucity of outlets, they took a cautious, neutral line. And they sat against the backdrop of a similarly bland state owned broadcaster. So I have always thought the high level of plurality in the newspaper industry here in the UK is precious, something to be proud of, something to treasure. So I was truly honoured to be asked to play a part in the evolution of the industry from its print only past to its digital future. The various publishers represented here are pursuing different business models, and I won’t get drawn today into a long debate about the relative merits of those models (you’ve heard enough from me on that before in the past). But I think we’re all trying to achieve basically the same thing, all trying to evolve a sustainable model for the future … because we think professional journalism is vital for our country and its continued success. We think about this a lot in this building – on the editorial floors, and on the other floors too – and I guess everyone else here today does as well. But we need to talk to people outside this room too. We need to remind people what makes us special. Remind them how our journalism makes a positive impact. And remind them what would be lost if we were not around. Let’s make that the focus of what we are trying to preserve, because it is a good thing to do – it truly is a job worth doing – and because it’s a pretty good foundation for our commercial success too.